I went out of town and I missed you much more than I had expected. With every corner I turned I thought of you. The first time this happened I was in Chicago. This week I visited Louisville, Ky., a city that for years I have called the hometown of my heart. I lived there for five years and though I was born and raised in Birmingham, Louisville is where I became a woman. It's the city in which I truly found my voice as a writer during my days a reporter and columnist at a local paper. And it's the city where I met and married the love of my life. But during my latest visit to Derby City something was different. Though I enjoyed my time there and loved seeing old friends, though I still know the streets of that city like the back of my hand, and though Louisville will always have a special place in my heart, that city no longer feels like home. And, Birmingham, it's all your fault. Four years ago you lured me back to you and now I wonder if you've ruined me for any other city that wants to call me her own. I didn't even see this coming. My first year back here with you was tough and in my frustration I stayed fixated on your flaws. But then I decided to open my heart and open my mind and really give you a chance. I'm so glad I did. No, you are not a perfect city. You have a lot of growing up to do. But so do I and you love me nonetheless. You took my dream of starting an organization for women writers and embraced it wholeheartedly. And who knew that it would be here in Birmingham that I would finally get the inspiration and courage I needed to finally pursue the dream I've had since I was 15 years: starting a magazine. 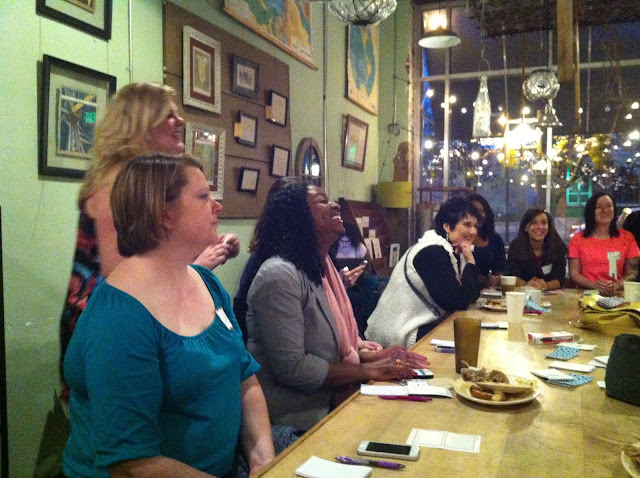 Last night you wowed me with one of the most beautiful displays of sisterhood I've ever seen at the first official meeting of the Birmingham Girl's Club, a new organization meant to support local women with entrepreneurial minds. Birmingham, thank you for teaching me the true meaning of the phrase "There's no place like home." "If you can, you should." The new Birmingham Girls Club logo! Tara Hulen took this photo and caught me mid chuckle. Clearly, I had a great time. Sherri gave us all free notebooks! You know I love notebooks! Nearly 30 woman crowded around the community table at Urban Standard Coffee for last night's meeting. To learn more about the Birmingham Girls Club visit http://birminghamgirlsclub.com. Awww, *tear*. If I hadn't been sick as a dog yesterday I so would have been there. I've been missing all the fun lately due to sickness and work. Hopefully I will be able to see you and some of my other favorite Bham ladies at an event soon.